In each part I will discuss different ways to troubleshoot and solve potential problems. 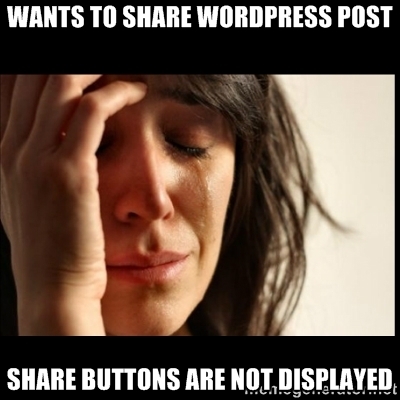 The sharing feature of WordPress.COM involves selecting different buttons and having displayed on your website. The primary problem of Sharing is that the buttons are not displayed. Identify that you have enabled sharing on the post. In the Dashboard–>Post–>New Post screen if you scroll all the way to the bottom you will see a button. Make sure you have it enabled. If you have an older post that you want sharing buttons to show-up on you have to go back and enable it on that specific post. If you notice above the “Show Sharing Button” is clicked. This now will allow the post to receive the buttons. If you click on the button it will become the default setting for the post-editor screen. If you want a post not to have the buttons make sure you unclick it. Confirm that you have enabled the sharing services by using Dashboard–>Settings–>Social and that you have selected to “Show Buttons On”at the bottom. Make sure your theme allows for sharing buttons as they are theme dependent. For example, you may specify you want the sharing buttons to show-up on the front page but some themes do not all that. WordPress provides a set of default buttons and allows you to create your own. In this example I created a PATCOSTA sharing button that connects a user to my www.patcosta.com WordPress.ORG website (this one). Sharing URL: A link to where the button goes to. Icon URL: a link for the icon. Note 1: If you do not provide an icon link the Service Name will be displayed. Note 2: Your icon link needs to be 16px by 16px. Anything larger won’t be displayed properly. Note 3: I pulled my icon from http://www.iconarchive.com/. When pulling icons make sure you follow the licensing rules. –>When finished with the icon be sure to drag it to the grey area to enable it. This section has 4 parts and provides a couple options on sharing the buttons. To find the section use Dashboard–>Settings–>Social and scroll all the way to the bottom and find this area labeled Button Style. 1. Button Style: This part has 4 sub-parts and allows customization of the button appearances. D. The Official Icon button will use/display the official icons of the social media sites. 3. The next part is an Open Links in: Selecting New Window means once a button is clicked a new window will open. Selecting Same Window means once a button is clicked a new tab will open-up in users the browser. The final part is a “Show Buttons On”: This section allows you to customize where you want your sharing buttons located. The last section of the Sharing screen had 4-parts. 1. You can set your Twitter handle that will display your name when people tweet your post from your page. 4. The Comment Likes section allows bloggers to like comments posted on your page.